I am happy to announce the first guest post today. 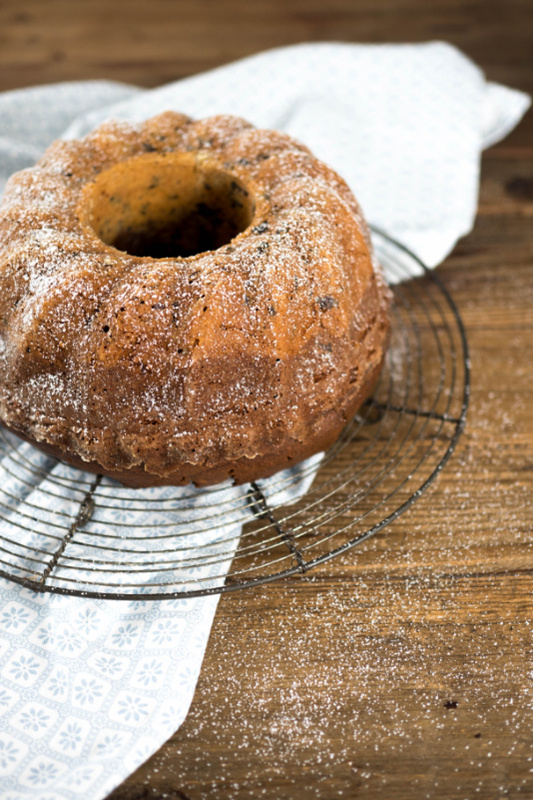 Marileen from the blog HOLZ & HEFE (in German) brought along some delicious marble bundt cake for the coffee invite event. In case you don’t know, I am currently organizing a blog event in which I ask you to make something from scratch and invite somebody for a coffee to share. Check here to read what this event is about. First of all Happy Birthday to your first blog anniversary, Jenny! I love your blog event! Just like you I love to invite friends for a coffee in my apartment. But not just for coffee with something sweet, also for breakfast or dinner. One of my favorite activities is to just chat with my friends. By the way, my name is Marileen and I have been blogging on HOLZ & HEFE (in German) about crafting, baking, travelling and recently also sustainability, which is a new important topic of mine. When Jenny asked me whether I wanted to make a cake for her event, I was all in. 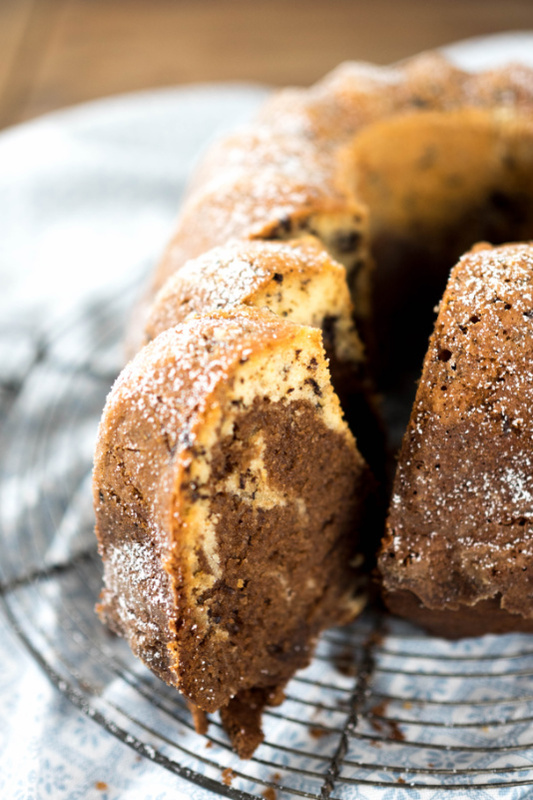 Nothing beats the classic marble cake for the traditional coffee with cake. Maybe you think: “Oh, that is boring.” I beg to disagree, this marble bundt cake is prepared with real chocolate, not just cocoa powder. The cake doesn’t look as dark as a result, but it contains the extra chocolate flavor! Grease and flour the bundt form thoroughly. Preheat oven to 180 degrees Celsius. Cut chocolate in small pieces. Set aside half and melt the other half on low heat while stirring. Cream butter, sugar and salt for a few minutes until light in color and fluffy. Add eggs, one at a time and beat in each for at least 30 seconds. Add the vanilla extract, heavy cream and amaretto. Once everything is creamed together, add flour and baking powder. Just mix until combined. Divide dough in halves. Add the melted chocolate to one part and mix until evenly brown. Fold the cut chocolate in the light batter. First put the light colored batter into the bundt form, then the dark one. Use a fork to marble the cake. Bake for 50 minutes, inserted toothpick should come out clean. 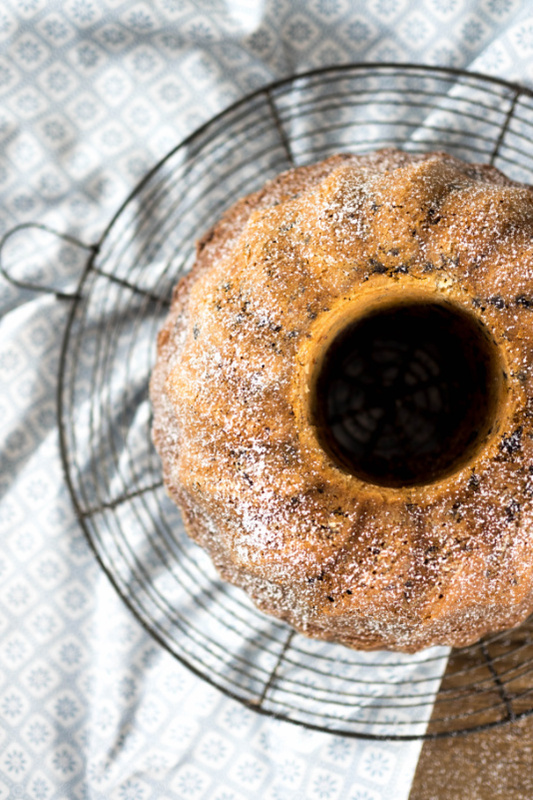 Let cake cool off in bundt form for ten minutes, then using a spatula, slowly take it out. If it doesn't come out easily, place in freezer for a few minutes. Either garnish with icing sugar or chocolate ganache. I’ve invited some friends today for coffee with cake and I am going to prepare everything now. Have a great Sunday and feel free to check my blog HOLZ & HEFE (in German)! das ist eine nette Idee von Dir, die Leute zu einer gemeinsamen Kaffeetafel aufzurufen. Und prima, dass Du gleich so tollen Beistand von einer so netten Bloggerkollegin wie Marileen erhalten hast. Wir haben am Sonntag eine Familienfeier, da werde ich den Marmorkuchen gleich mitbringen und freue mich schon darauf. wie schön, dass du mitmachst und dafür Marileens Rezept hernimmst! Wenn du magst, kannst du mir im Anschluss ein Bild schicken und kurz berichten wie es war. Kannst du an info at jennyisbaking punkt com senden.